CLEVELAND, OH--(Marketwire - November 26, 2008) - Keithley Instruments, Inc. (NYSE: KEI), a leader in emerging measurement solutions, announces ACS Basic Edition, characterization and curve tracer software for component test applications. The latest addition to Keithley's powerful Automated Characterization Suite (ACS) family, ACS Basic Edition, integrates with the industry's broadest range of source-measure units, Keithley's SourceMeter® Instrument family. ACS Basic Edition, paired with Keithley's proven line of SourceMeter Instruments, replaces obsolete curve tracers with a solution that performs both basic curve tracing as well as parametric test while providing significant cost breakthrough. ACS Basic Edition is available immediately; to learn more, visit http://keithley.acrobat.com/acsbasic/. 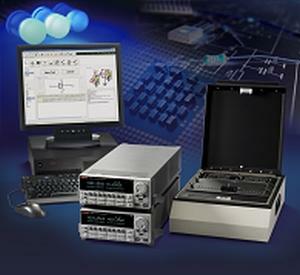 Keithley first introduced its ACS integrated test systems in 2007 as highly configurable, instrument-based systems for semiconductor characterization at the device, wafer, or cassette level, offering unique measurement capability with powerful and flexible automation-oriented software. Initial ACS systems were designed for larger semiconductor lab applications that call for a probe station and large-scale on-wafer test applications. ACS Basic Edition is targeted for bench-top component test applications that don't require integrated probers yet still need the measurement and software automation power provided by the ACS platform. Unlike other test systems, ACS Basic Edition provides an extensive library of pre-configured component test routines to shorten start-up time, reduce programming code development and simplify the process of test. ACS Basic Edition combines the ease of use of a curve tracer with the analytic capabilities of a parametric analyzer. With ACS Basic Edition, anyone can test a semiconductor component in seconds and compare the characteristic curves with reference curves immediately. ACS Basic Edition provides a variety of tools that makes it simple to reconfigure for different component types. The technician simply selects the graphical icon of the desired component type and selects the desired test, and moments later the characteristic curve is displayed. ACS Basic Edition performs with the ease of use of a curve tracer, but also provides the tabular data in spreadsheet form. This additional functionality is complemented by a "formulator" that allows mathematical or parametric extractions to be performed on the raw curve tracer data. This advanced capability means that parametric characterization is as easy as using a curve tracer. In those cases when more than a single test is needed, ACS Basic Edition provides a powerful multi-test capability that allows the user to string together a number of different tests on a single device. Keithley's System SourceMeter Instruments provide the source-measure power behind ACS Basic Edition. ACS Basic Edition can be configured with any Series 2400, Series 2600, or Series 2600A instruments to provide high power or low-level characterization, from a powerful 1kW pulse to a very sensitive 1fA measurement resolution. When characterizing high power devices, ACS Basic Edition is typically combined with the Keithley Model 2612A Dual-channel System SourceMeter Instrument, which provides up to 200V per channel (400V differential across two channels) or 10A pulse (1.5A continuous). For even higher power testing, ACS Basic Edition can be combined with the Keithley Model 2430 1kW Pulse Mode System SourceMeter Instrument for sourcing and measuring up to 100V at 10A with 150 micro-second pulses. When characterizing sensitive components such as advanced silicon gates or nanoscale devices, the Keithley Model 2636A Dual-channel System SourceMeter Instrument is typically used. The Model 2636A provides two source-measure channels with 1fA measurement resolution. A mix of SourceMeter Instruments can be combined to provide a very wide range of capabilities within a single configuration. ACS Basic Edition not only supports Keithley's line of System SourceMeter Instruments, it also supports a wide range of switching solutions, popular LCR meters, and component test fixtures. Combining ACS Basic Edition's multi-test capability with Keithley Series 3700 or Model 707A switching mainframes allows a number of tests to be performed on a more complex component such as a resistor network, op-amp, or another higher pin-count device. Some components require both DC I/V testing as well as capacitance or C-V measurements. ACS Basic Edition can easily combine DC I/V tests with LCR measurements using multi-test and switching. Initial ACS systems today are found in package level and wafer level device characterization test applications that include parametric die-sort, wafer level reliability, parametric characterization, and component test. All ACS systems, including the new Basic Edition, share key components that result in test project portability and correlation across a wide range of systems. For instance, a project developed in Basic Edition can be run on any ACS system that uses the same hardware foundation. This means that small scale ACS Basic Edition test systems that might incorporate a single SourceMeter Instrument can be used to develop test projects for a multi-site die-sort system using 20 SourceMeter Instruments. Pricing for Keithley's ACS Basic Edition software is $4,995.00 USD. A minimum configuration suitable for high power device characterization costs $14,000 USD. Availability is immediate. With more than 60 years of measurement expertise, Keithley Instruments has become a world leader in advanced electrical test instruments and systems from DC to RF (radio frequency). Our products solve emerging measurement needs in production testing, process monitoring, product development, and research. Our customers are scientists and engineers in the worldwide electronics industry involved with advanced materials research, semiconductor device development and fabrication, and the production of end products such as portable wireless devices. The value we provide them is a combination of precision measurement technology and a rich understanding of their applications to improve the quality of their products and reduce their cost of test. About this company Keithley Instruments, Inc.